Several new bits of information have come out over the last couple of days since Sentai announced the K-ON! Movie license, not the least of which is the announcement of the release date: May 21st will see the release of the movie on Blu-Ray and DVD, with SRPs at $39.98 and $29.98, respectively. 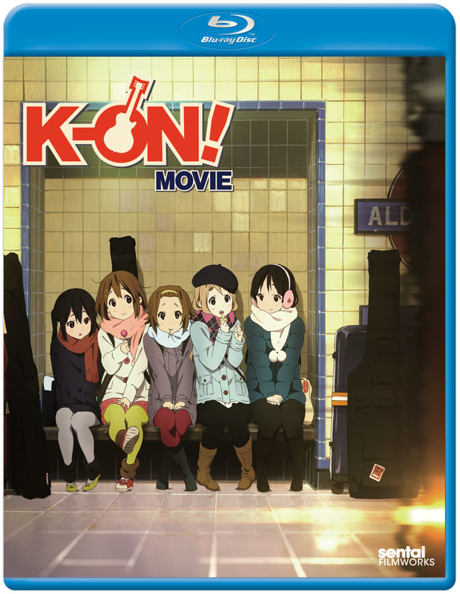 Bonus features will include: Interviews, K-ON's Anniversary, 1-2-3 K-ON!, Live Event, K-ON in London, trailer, teaser, and clean opening/closing animation. The (possibly not final) cover has surfaced as well, based on the Japanese regular edition’s cover. Credit goes to the always-on-top-of-things WTK. In related news, Manga Entertainment announced in their most recent podcast their license of the movie for the UK market, and their intention to release it on DVD and Blu-Ray later this year. They also implied that they are likely to license season 2 of the TV anime. No word on whether UK fans can expect a Blu-Ray release of the series. This is great, this news has made my day. Thank you, I actually first heard this news on this blog. Keep up the posts, keep the K-On! dream alive! While there's still no commentary or physical extras, it's still an impressive amount of extras. The dub will probably be disastrous but I'll watch it anyway. Besides, I was going to be buying it either way since I want a physical copy of this movie more than anything else in the world at the moment. I suppose the dub will be similar to season 2. And yes, this kind of an amount of extras is impressive, at least compared to the series BDs.